Looking from the outside, it’s almost impossible to tell that there was an undisclosed haven bringing like-minded people together in the residential area between Thonglor and Ekamai. 12×12 is a hidden place to mingle with a sense of being a Japanese hipster in the air. Beautiful mixologist Khun Tar is the one who crafts cool cocktails, each of which comes with a strong character. 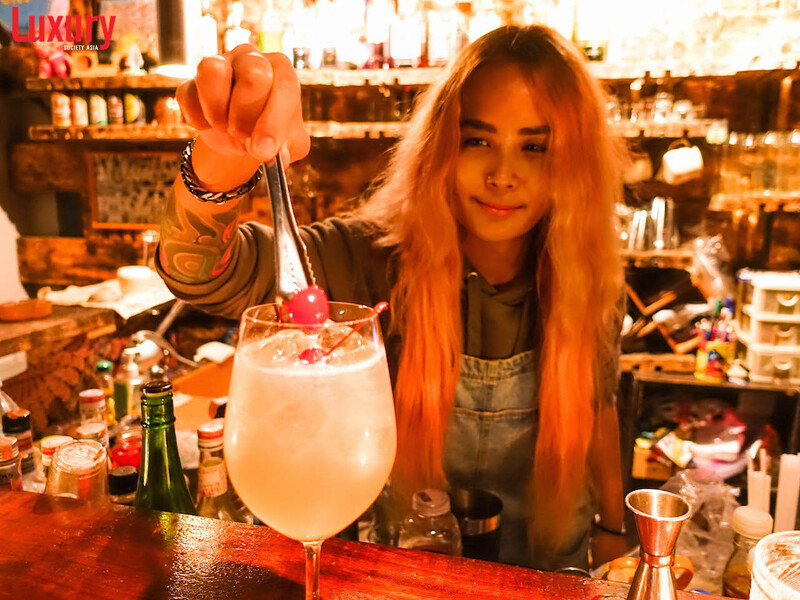 One of the bestsellers, Umami, is a meticulous mixture of umeshu, cherry brandy, peach schnapps, SangSom, vanilla syrup, and topped with bullet wood flower which results in lady-ish flavors with a faint tang of alcoholic content. In one sip, the liquid introduces itself with ume fruit taste, followed by a bit of sourness, and leave the cherry aftertaste in the mouth. Elder Cranberry Frozen comprises of white wine, triple sec, peach schnapps, bourbon, elderflower syrup, lime juice, cranberry juice, and Schweppes tonic. The drink contains multitude of liquids for a good cause – to create a drinkable sophistication. 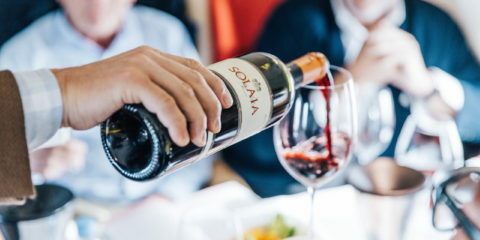 The glass gives warmth to the body, whilst its sweetness is flawlessly harmonized by bitterness and sourness, turning itself into an electrifying glass. The dainty Pink Lady looks gorgeous and taste wonderfully smooth. Its light yet creamy texture encompasses Beefeater gin, triple sec, grenadine, sugar, rum, and whipped cream, and the overall taste resembles a glass of grown-up’s milkshake. Names can be deceiving. Tokyo Iced Tea doesn’t at all taste like what it sounds like, as the cocktail contains 6 liqueurs and no tea! Rum, gin, vodka, triple sec, tequila, Midori, with a bit of brown sugar, combining together, and there emerge a cool and tangy glass. Flower Therapy a modest mishmash of chrysanthemum-infused vodka, egg white, and a touch of lemon peel. Led by the aroma of chrysanthemum flower and accompanied by the zest of lemon, the floralness is dominant and the drink is dressed by subtle bitterness. This is a very charming one. Oatsan is named after a guest who requested for this mix, before it unexpectedly becomes one of the bar’s most favourite signature. Bourbon, amaretto, and sweet vermouth make a masculine drink with almond aftertaste. If you like Old Fashioned or Negroni, then this one is going to be your next crush. 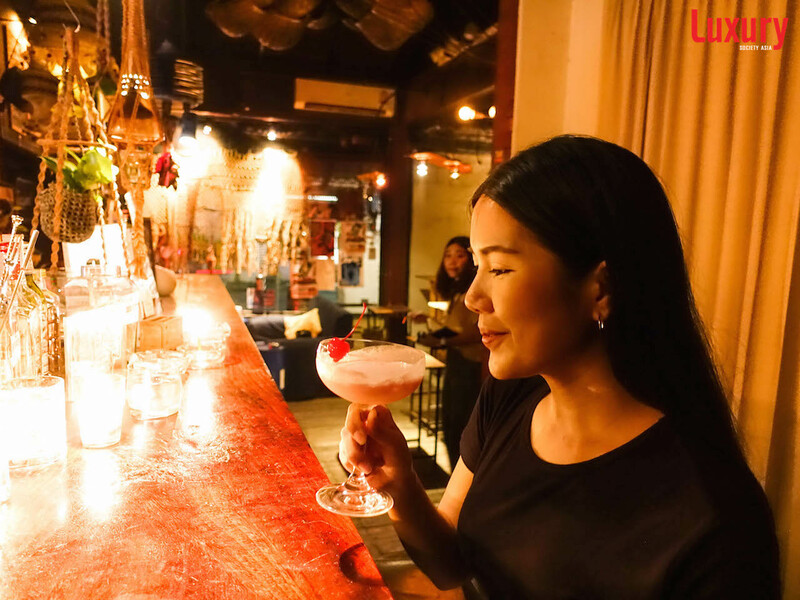 Our lovely guest, Khun Suthida Phisranson, who is a cocktail person with preference for strong ones, picks Flower Therapy thanks to its unique artistry like nowhere else, as well as Oatsan for its full-grown taste. It’s actually difficult to pick just one to drink in a night at 12×12.